By family tradition this emerald once belonged to Empress Eugénie of France. 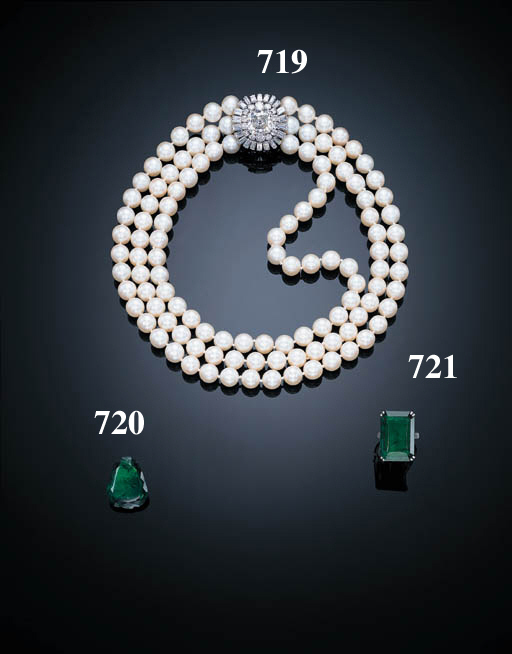 Apparently, it was purchased from the Empress by a client of Marcel Chaumet who in turn sold it to Chaumet. He later offered it for sale to the present owners. The stone's shallow cut with pierced ends indicates that prior to the possible connection to Empress Eugénie, the emerald may well have been worn as a "taviz", an Indian amulet with the emerald representing one of the nine planets of the Hindu astrological system, the "Navagraha". It is interesting to note that most "taviz" were cut in this flat form as legend dictated that the stones must touch the wearer's skin to negate danger and to attract beneficial influences.